I wholeheartedly believe a healthy life doesn't go without the spiritual element. God designed it that way. He created our physical bodies and they are a gift to us. Taking care of these gifts (as any other) should be an extension of our worship to Him. But, even if we do believe this, sometimes our own minds and spiritual struggles get in the way. A truly healthy life means healthy mind and spiritual lifestyle along with a healthy body and environment. I have molded together writing/blogging the messy parts of my life and teaching/coaching healthy living from my experiences and education, in order to help you . This list of resources have helped me on my journey but placed here with you in mind. My hope is that they would be a help and encouragement to you as it has been for me. I am always adding new things so please stop by often! My blog Unpolished Rubies is a platform I use to share, in a REAL and transparent way, my experiences, struggles, and successes in living a healthy lifestyle, homeschooling journey with my two little people, and whatever God chooses to teach me in my messy life. Have you found yourself increasingly frustrated with trying to tackle motherhood in today’s cultural climate? I know I have – this motherhood thing is not always easy stuff! If you’re looking for some encouragement, I have just the book for you! Becoming Mom Strong by author Heidi St. John addresses many of the fears and insecurities that we moms face. Speaking from her own experience as a homeschool mom of seven (yes, seven! ), Heidi’s book is packed with relatable anecdotes and biblical wisdom, reminding us moms to become strong in the Lord so that we can impart that strength to our kids. Does it invade your HOME? 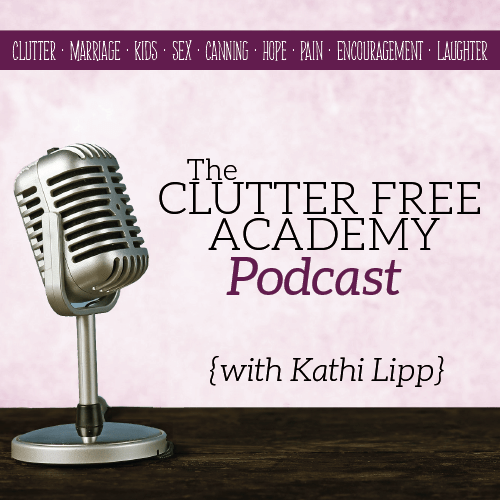 Clutter can intrude in ways we never thought, bringing OVERWHELM to our lives. Are you a Highly Sensitive Person(or HSP)? Knowing and learning about my HSP helped me decrease the stress and overwhelm in my life, helped me become more in tune with my emotions, and gave me a healthier perspective about myself. I am also a recovering perfectionist and people pleaser. Getting a handle on these struggles in my life have definitely contributed to my health journey. Following Cheri's Podcast Grit 'n' Grace Girls with Amy Carroll , really helps keep me encouraged in these areas.